Pictured is a chalice from the pontificate of Pope Pius IX. 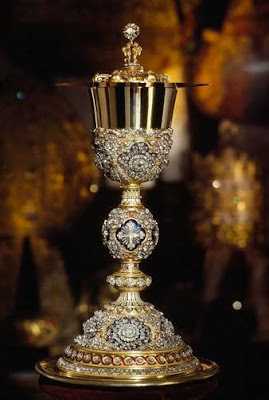 As you can see the chalice is encrusted with precious stones -- diamonds mainly. 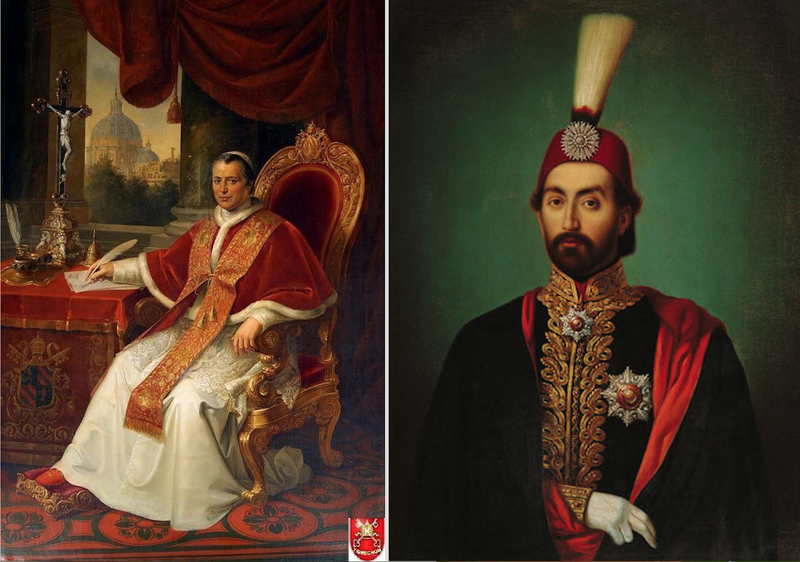 These jewels are said to have come from the bridles and bits of horses that were gifted to the new pontiff on the occasion of his coronation; a gift from the Ottoman Emperor, Abdulmejid I. The precious stones were then taken from them and repurposed to the sacred use seen here. Now there is a common critique about the use of such things within the Church that would suggest that such things are a scandal to the faith; that they are worldly and should be sold to feed to poor -- something the Church already does in abundance and probably more so than any other institution in the world. This way of thinking is more common than one might think -- one might even say that it has become something of a cliche. Putting aside the question of what the motivation of this critique is for some outside of the Church (which isn't safe to speculate upon anyway), for those who are within it I do wonder if they have stopped to consider that the very root of this critique is precisely founded in a worldy and materialist mindset? It springs from the very thing they purport to critique: materialism. The materialist mindset looks at these things and can only see one thing: monetary value. That mindset can almost see nothing else, stopping at the object itself and going no further. A very different sort of mindset looks at these things and sees something else entirely: beauty; beauty at the service of divine worship. These things are seen as precious, it is true, but not so much because of the thing itself as much as their consecrated purpose. Their value is not founded upon "market values" but rather upon their worthiness as vessels of that which has infinitely greater value: the sacred liturgy and the sacraments. Far from being inappropriate for liturgical use then, the sacred liturgy is precisely where these should be found. Where better after all? Is it better that these precious stones and metals should adorn some worldly ruler for his own personal glory and status, or rather that these things, a part of the beauty of God's own creation let us recall, should be rendered back to God -- not because they are materialistically valuable but rather because they are materially beautiful? St. Francis of Assisi knew this distinction well and lived it. St. Francis and his brothers lived in personal poverty, but for the worship of God only the very best was used. Too many today reverse this and see divine worship impoverished while they themselves live in relative and private luxury. Let us restore again the right ordering of these priorities and not be ashamed of that which brings beauty, dignity and decorum to the sacred liturgy, speaking to its inestimable value. Ad majorem Dei gloriam.